Detailed instruction, providing you with a road map as well as a blue print to improve nearly any area of your game. Each course includes video lessons, detailed text explanation, reference to professional examples - and the lessons are grounded in basic biomechanics as well as fundamental teaching methods. There is a world of online instruction now available - I believe ours is unique as we strive to be lucid, accesible, and in nearly all instances with the opportunity for actual evaluation of your technique from your own video submissions back to Jim. ETI Network is a unique online membership community for players committed to taking their game to the next level. Each month we introduce a lesson plan that focuses on basic elements of the game. Designed to build a fluid, balanced, effortless serve. Grips, mechanics, spin, sequential analyses, on court drills – you will be able to refer to this coursework again and again. One and two-handed mechanics, topspin, slice, videos of the pros; your blueprint for a vastly improved backhand. Deconstruct the Federer and Djokovic backhands to improve your own. 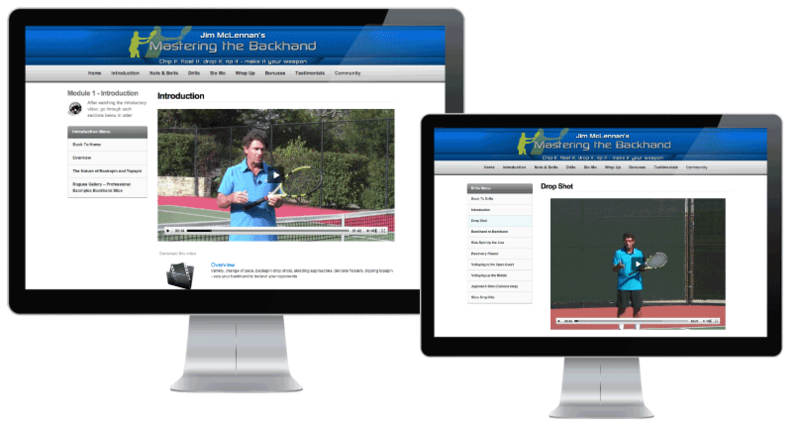 Total forehand instruction that covers both one and two handed shots, on court slow motion demos, professional examples, your key to master the modern forehand. Master the foundational elements of your backcourt ground game. Swing path, point of contact, balance, and footwork, videos of the pros – all begins with the foundation and your game is no different. To help you become more competitive, winning and losing is less about hitting winners, but more about competing intelligently, understanding the court, understanding your options, and trusting your skill set to make it happen. Movement is the name of the game. For serious improvement – look down at your feet. “Secrets” features the footwork of Stefan Edberg – and includes on court aerobic drills, an online workbook and more. Many elements of a strong and fluid overhand throwing motion will improve fluidity and power of your game. 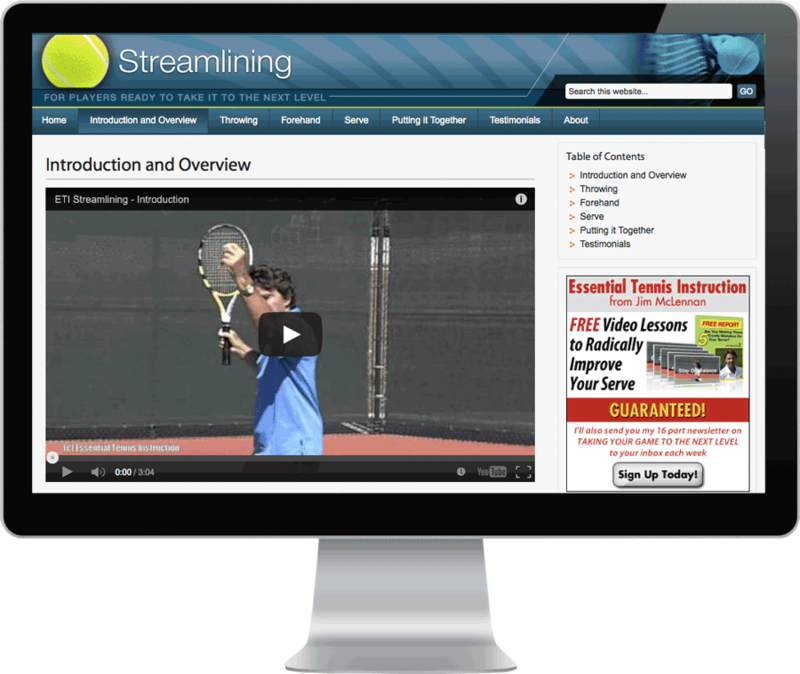 “Streamline” your forehand and your serve, and even improve your throw along the way. Basic, accessible, and reasonably priced - 5 keys to the drop shot, one handed topspin backhand, the modern double bend forehand, and a primer on grips. So much of our game is played between the ears - explore the art of winning, competing against the pusher, playing smart tennis, and keys to your competitive gut check. If a picture is worth a thousand words, and a video is by extension worth many thousand words – I believe our unique “Stroke Review – Foundational Coaching Method” – will be priceless. ETI Network is a unique online membership community for players committed to taking their game to the next level. Each month we introduce a lesson plan that focuses on basic elements of the game. 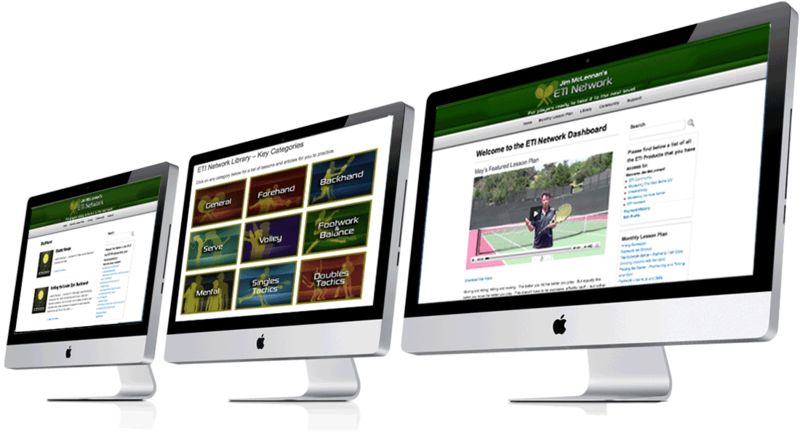 The ETI Network includes a massive, searchable library of over 400 lessons, and provides both an excellent resource as well as a way for you to systematically improve your game. Everyone truly wants to play better - the ETI Network will do that for you. I am confident that the “5 Keys” format will speed your acquisition of these (and other) tennis skills. Each mini course is broken down into 5 key lessons. Within each course, like all my ETI Products, you can comment or ask a question and I will get back to you with an answer. We currently offer two modules: each module has 4 distinct lessons. 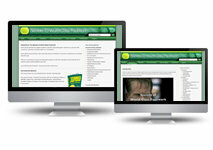 An online multimedia resource for players, coaches and students of the game. With 30 videos, and companion booklet and drill sheets can all be downloaded for your convenience. 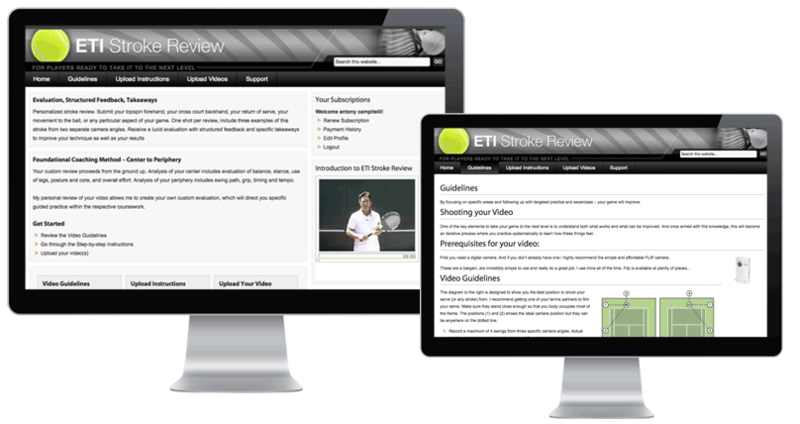 Also includes a complementary stroke review valued at $47 – this is where I personally review your serve and provide detailed structured feedback with the exact exercises, highlighted sequential elements and specific articles tailored to your needs. Your all inclusive, step by step method to master the elements of the Kick Serve – and with more spin on your serves you will play with more confidence, and win more of those close matches. The videos in each of the key sections can also be downloaded for your convenience. This product comes also comes with a number of bonus products , one of which is The Side Spin Serve, which addresses several key issues that I see a lot when teaching students each and every week. 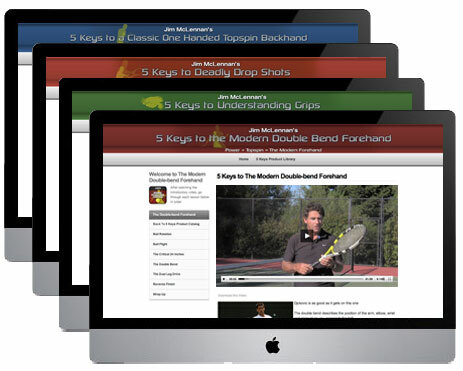 Your all inclusive, step by step method to master the elements of the forehand. The lessons in each of the key sections can also be downloaded for your convenience. MACG is an online course designed to help you become more competitive. So much of our game is about technique and decisions. Technique that enables you to take the ball or the rise, or scramble and through up defensive lobs. But equally the ability to decide what is the shot that offers the least risk and the greatest reward - and that is the nut of creating offensive and equally defensive pressure. Ofttimes, winning and losing is less about hitting winners, and more about competing intelligently, understanding the court, understanding your options, and trusting your skill set to make it happen. Your all inclusive, step by step method to master the elements of the Ground Game. The Videos in each of the key sections can also be downloaded for your convenience. Inside Out and Outside In – You can accelerate or decelerate the racquet through the contact zone – either popping or dragging the racquet head – it all depends on the difficulty of the incoming ball. I originally created this as a video some 8 years ago. And then, as now, I believed that truly the secrets to footwork are simply – starting quickly, regaining balance, and timing the split step. Further, as is often the case, too many people obscure these elements of footwork when emphasizing explosive movements and more. Plain and simple – good footwork means moving quickly and easily, gliding, hitting on balance, and being on time for the opponent’s subsequent hit. Footwork is the name of our game – and it can become the cornerstone of yours – master the secrets! Do you know the meaning and feeling of being "light on your feet"? Are you slow to start to the ball, or sometimes off balance during the hit? Are you willing to practice a proven aerobic choreography to master these skills and more? Footwork is the name of the game - and truly balance, starting moves and finishing positions are so often overlooked - you have seen others move gracefully - if you want the same this is the course for you! Submit your topspin forehand, your cross court backhand, your return of serve, your movement to the ball, or any particular aspect of your game.One type of shot per review, include three examples of this stroke from two separate camera angles. Receive a lucid evaluation with structured feedback and specific takeaways to improve your technique as well as your results. Analysis of your center includes evaluation of balance, stance, use of legs, posture and core, and overall effort. Analysis of your periphery includes swing path, grip, timing and tempo. My personal review of your video, combined with your own self assessment, allows me to create your own custom evaluation, with both an analysis of technique and specific practice recommendations so that you can make the needed corrections and improvements. This self assessment gives me a chance to see how you got to this point, and what you feel about it, as well as what others may have suggested that either did or did not work. Swinging easily yet hitting hard. Tennis is a game of rhythm where players are rewarded with effortless swings. But the secret lies (and yes there always seems to be a secret) in using your body and arms naturally, very much like the rhythm and feel of an overhand throwing motion. Discover the elements of pulling, sequencing, shift of weight and lagging – and imprint this on your forehand and your serve.